A hoax spread online this weekend about ethereum’s inventor, caused the digital currency to lose some $7 billion in market value in about 36 hours. The hoax, posted anonymously on the message board 4Chan this weekend, claimed the creator of ethereum, Russian programmer Vitalik Buterin, had died in a car crash. After the hoax started spreading, Buterin shared a portrait holding a piece of paper with recent code generated by the ethereum blockchain, to prove that he was alive. This recent fall is closing a terrible month for ethereum, after a semester of impressive growth. 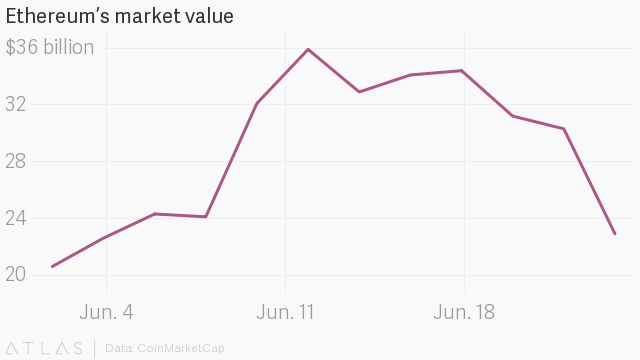 Ethereum’s market value went from $20 billion in early June to almost $38 billion on June 12, then down to about $24 billion on June 26.